This garlic and herb sautéed bell pepper recipe can be used to create an appetizer, part of an antipasto platter, or a colorful side dish. The bell pepper strips cook up quickly and are at their best paired with the garlic and herbs. 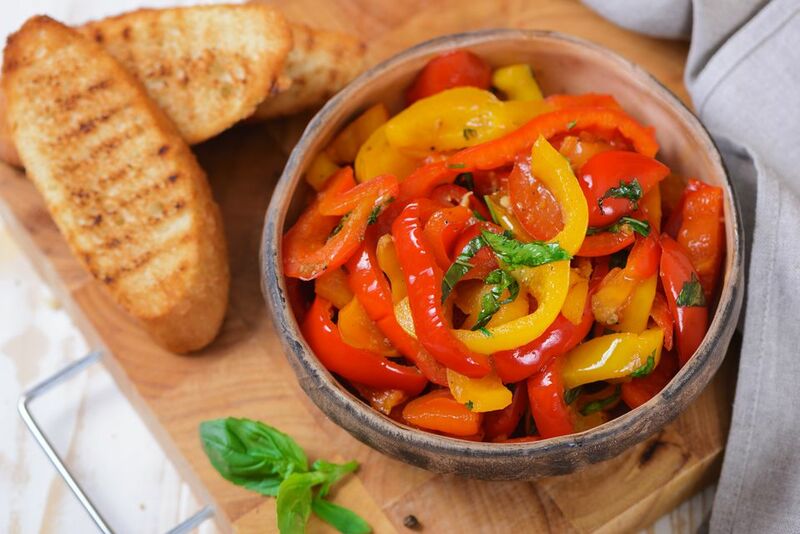 This sautéed pepper recipe is a great way to enjoy this nutritious summer vegetable. In a large skillet, heat the olive oil over high heat. Add the pepper strips, and sauté for 4 to 5 minutes, or until the peppers begin to soften. Turn down the heat to low, and add the garlic, salt, and pepper. Sauté for 2 minutes more. Turn off the heat and add the vinegar and herbs. Toss to combine. Toss again, adjust seasoning and serve with toasted bread if desired. Serve as part of an appetizer or antipasto platter and enjoy. High in vitamin C and fiber, bell peppers come in a wide variety of colors besides the old standby green. While there's not much difference in taste, a yellow or red bell pepper can add a splash of color to your recipe, which is a nice addition to this particular dish. For any recipe, choose bell peppers that are firm with smooth skins. Avoid purchasing bell peppers that have bruises or soft spots, or that have wrinkles, as they won't taste as good. The easiest way to prep your peppers is to cut them in half and pull the halves apart. Take out and discard the seeds, stem and inner membranes (the white parts). You could also "core" your peppers if you're planning to stuff them, but for the purposes of this recipe, it's easier to halve them and chop them up than scooping out the innards from the top. Always rinse peppers well before cutting into strips or chopping. Avoid overcooking peppers; unless your recipe calls for charring, the taste of burnt peppers is very different (and less appetizing) than the flavor of their natural sweetness.